You are currently browsing the tag archive for the ‘ice hockey’ tag. In ‘Hors-jeu’ we watch a soccer match change into a basketball match and into an ice hockey game. When violence enters, however, the game stops. With this short film Schwizgebel builds on the concepts introduced in his previous film, ‘Perspectives‘. 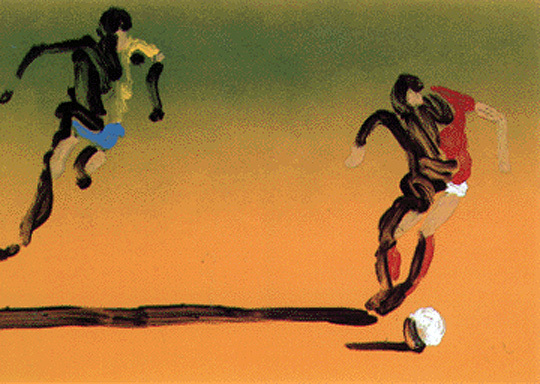 In ‘Hors-jeu’ he incorporates sound-effects and a rather surrealistic play with the rotoscoped images into his style. Surrealism would dominate his next film, ‘Le ravissement de Frank N. Stein‘ (1982), but in its visual style ‘Hors-jeu’ looks more forward to later films, like ‘78 Tours‘ (1985). ‘Hockey Homicide’ is an account of a frantic ice hockey game between two teams, of which all players share names with Disney employees (while the referee is named after the cartoon’s director, Jack Kinney). The cartoon is bursting with cartoon violence. For instance, there’s a hilarious running gag of two star players, Bertino and Ferguson, who, when they leave the penalty box, immediately start beating up each other, only to be send back into the penalty box again. But the real treat of this fast and furious cartoon is its final sequence, when the crowd takes over and the cartoon runs totally haywire, even using non-related footage from ‘How to Play Football’ (1944), ‘How to Play Baseball‘ (1942), ‘Victory Through Air Power’ (1943) and Monstro the Whale from ‘Pinocchio‘ (1940), to add to the feeling of complete chaos. 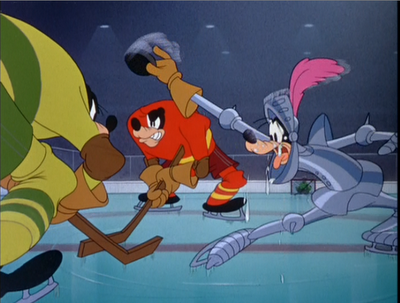 ‘Hockey Homicide’ must be the wildest, fastest and most violent cartoon Disney ever produced. Like earlier Goofy cartoons by Jack Kinney, it is clearly influenced by contemporary cartoons at Warner Bros. and MGM, and it has a genuine Tex Averyan spirit rarely seen at Dosmey outside the Goofy series. With ‘Hockey Homicide’ the Goofy series reached its apex. More entertaining films were to follow, but none as wild and extreme as this one. After it Kinney was fully involved in feature films, only to return to the Goofy series again in 1949. 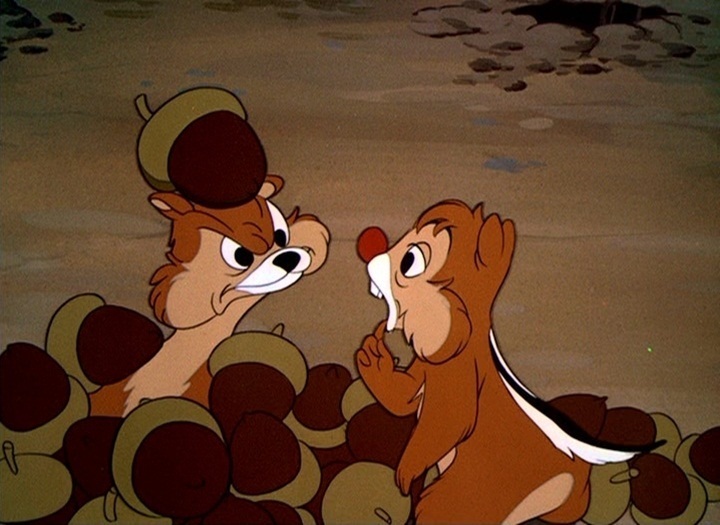 By then the humor of Hollywood cartoons had toned down. In the meantime five Goofy cartoons were produced: four directed by Donald Duck-director Jack Hannah, and one by Clyde Geronimi.